I learned early in my teaching career that the most mundane tasks can be thrilling to little kids when you give them hands on items to manipulate. I frequently used this little trick to teach spelling or phonics. Remember when we were in school and you had to write your spelling words 5x each? THE WORST! I was not subjecting my students to that. 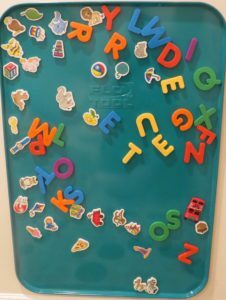 One way we practiced new phonics sounds, or spelling words was using magnet letters (check out my post for smaller, more portable magnet boards here). The kids loved it…so much so that it became a constant source of fighting during indoor recess (yes- they wanted to spell during recess). I finally bit the bullet and bought enough for each child to have their own. This is why teachers are poor. My students enthusiasm for the magnet boards made me think that I needed to have one of these in the girls playroom. I looked into buying one, and I nearly fainted when I saw the cost. I figured there was some sneaky way to DIY it, so I hit up pinterest (how did any of us get through a day successfully before Pinterest?). 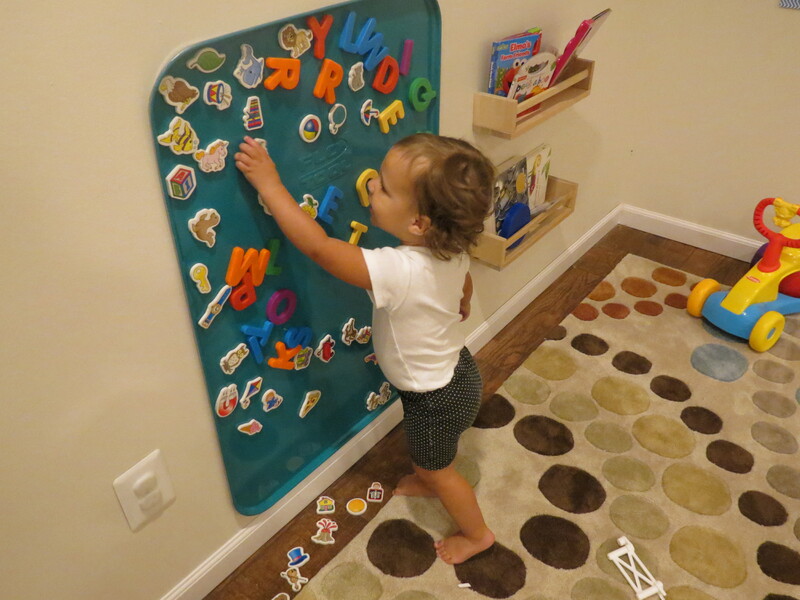 I kept seeing these oil drip pan magnet boards….I was skeptical, but it was cheap enough that I wanted to give it a try. I would put this in the Pinterest win category, but its certainly not perfect. 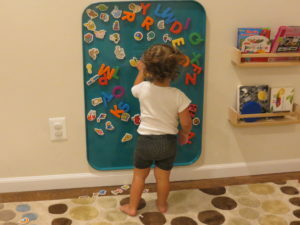 Here’s the run down on what is great, and what I wish I could change about these magnet boards. Large enough for more than one child to use it at a time. Magnets stick well and do not slide/fall down. Lightweight and very easy to hang on your wall. Its an oil drip pan. What I mean is, its not exactly pretty. To dress ours up a bit we choose to spray paint it. It made a HUGE difference, but does create a bit more work. They are easily bent/damaged. We did not have any issues with ours, but they are very thin metal, so if you are having it shipped and it arrives to you bent- have them replace it. The bumps/dents do show once you have it hanging. 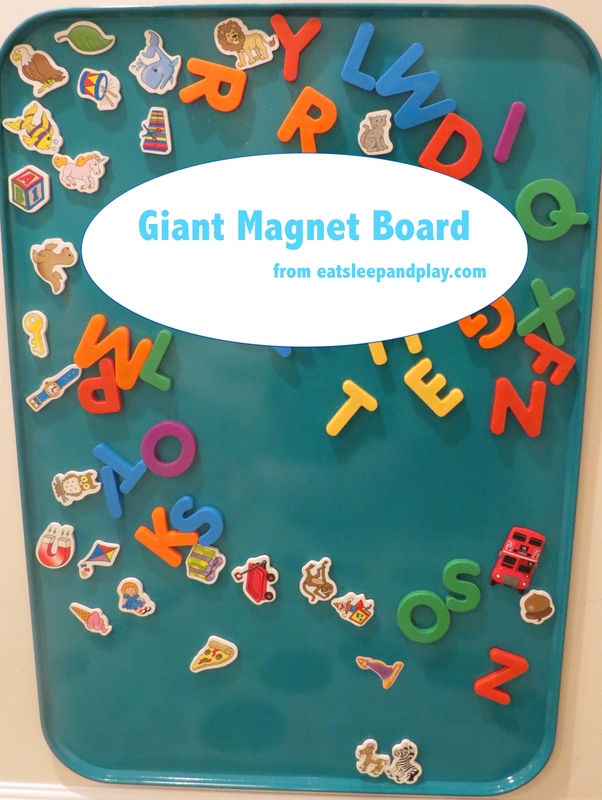 I have read complaints that after an extended period of time the magnets don’t stick as well and start sliding down- we haven’t experienced this problem however and we have been using our board for just about a year. Place your oil drip pan on a flat surface and spray paint with your choice of color. Allow this to dry before hanging (see instructions on you spray paint for how long they recommend, ours took about 2 hours). 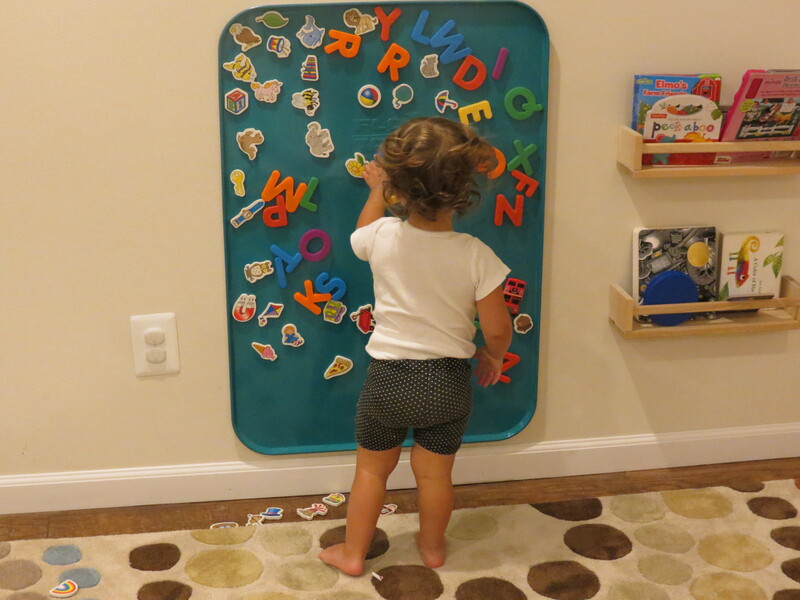 When your pan is ready to hang choose a space where your child can access it easily, and the whole board is within their reach. We placed ours right above to the floor molding in order to make is accessible to Layla even when she was crawling. Use adhesive strips to stick it to the wall, placing a strip in each corner, and 1-2 in the middle. Press firmly on the pan while you are applying the strips to the wall, but be careful not to dent the pan! 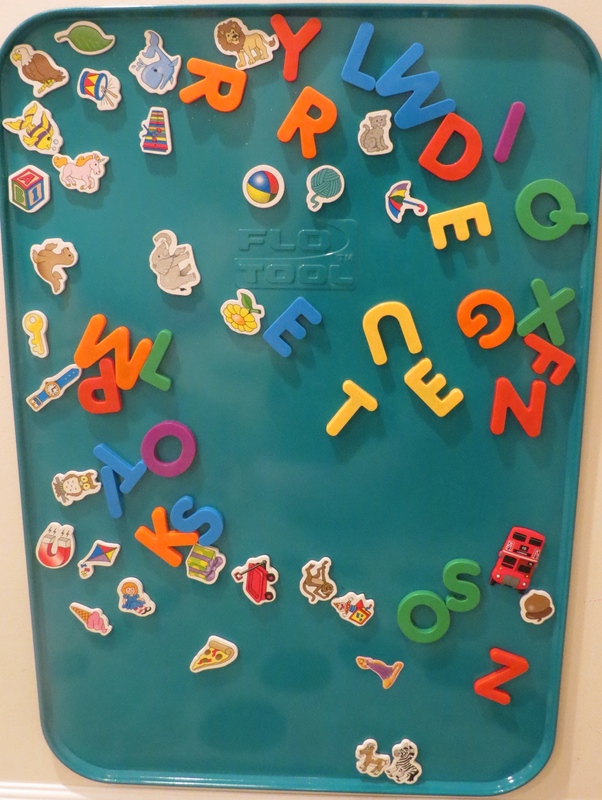 You can find magnets with pictures, numbers, letters, words, and so on. The uses for this board are really endless, and it is something that can grow with your child!